I thought it might be fun to take a look back at some of our favorite oldie but goodie books. So many times I find myself bouncing back and forth between the newest release, and an older release that was recommended to me. Here is an oldie that I was told I MUST READ! My aunts are big readers, and are constantly sending and giving me copies of their romance books. I love that I can sit and gush with them about some of my favorite authors and books. We give and get recommendations off each other all the time. 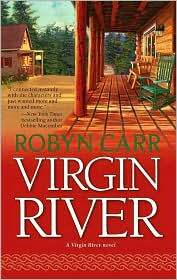 When I was told I absolutely HAD to read the Virgin River Series by Robyn Carr and went home with 4 books from the series, I figured I would be in for a great read. Virgin River features Mel, a recent widow looking to get out of the big city and into a slower way of life, where she doesn’t have to deal with the stares and questions from her friends. She finds an ad for nurse and midwife in a small mountain town and sets off for an adventure. After a disastrous start, she decides to give the place a chance. Jack, local bartender and retired decorated war hero fell hard for Mel the second she walked into his bar. He knew he had to have her, and worked all possible angles to keep her around. What started as a great friendship quickly morphs and grows into a passionate love affair. But when push comes to shove, will Virgin River be enough for them? I have to say, I adored this book. My initial impression of Virgin River was that the quaint town was filled with crack pots and anti-progressive old people. But that impression quickly changed and morphed to open my eyes to the sleepy little town far away from modern civilization, living off the love of neighbors and community. I love books based on small towns and the chemistry their citizens have with each other. It makes for some of my favorite reads. Mel and Jack were each great characters, a great couple, but at times drove me absolutely crazy. I loved that Mel was able to get the chance to really go on with her life, deal with the pain of loss, and fall in love again. Watching her struggle through the journey had me both smiling and tearing. The scene in the rain on the anniversary of her hubby’s death? Heart wrenching! At the same token, there were times when I wanted to smack her upside the head, because she didn’t seem to be able to get past her grief to see what she already felt and had with Jack. Likewise, Jack had his own struggles to deal with. I thought Carr did an excellent job of showcasing his history as a war vet, especially his constant struggles with civilian life. I liked seeing how he dealt with his soldiers coming into town, Mel’s sister and her protectiveness and the love his family had for each other. I’m always a sucker for stories where the men know exactly what they want from their women, and aren’t afraid to go for what they want, and Jack is one of the best! However, there were times when he just didn’t seem to trust his own feelings and instincts, and that to me seemed very out of character for him. All of the townies and supporting characters like Mel and Jack’s family were great as well. I really enjoy stories that showcase strong family values an solidarity. I’m hoping that many of the characters Carr put in the spotlight continue to show up in future books, and that the town really gets a chance to grow into an even more tight knit community. I’m anxious to get and read Preacher’s story, the 2nd installment of the series. The sneak peak from the back of the book seems great, and the few times he was in the spotlight, I enjoyed him immensely. I’m also excited to see where Carr takes the series and characters. Don’t anyone tell me, but I’m anxious to see if the young couple Ricky and Liz get a chance at love once they grow up a bit. I’m hoping we see more of Jack’s military buddies. I love Doc and his sarcastic antics, and hope he sticks around for a long time to come. All in all, I give Virgin River an A-. I LOVE this series. It’s a bit hokey but leaves you with such a warm glow. I just ordered book 7 and I’ll be reading it soon.